Cynthia Ferrell (bottom left) administered CPR to the minivan driver who slammed into a lamppost after he suffered a heart attack on April 2, 2015, she said. 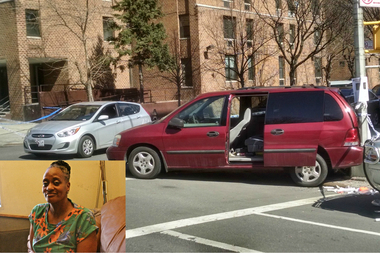 HARLEM — A pair of good Samaritans rushed to help a driver who slammed into a lamppost after he suffered a heart attack on Thursday afternoon. “I saw the [van] backing up. It smacked into the lamp post. Bam! The back window shattered,“ said Cynthia Ferrell, 54, who was returning from grocery shopping with her husband when they witnessed the accident. The red Ford minivan was traveling northbound on St. Nicholas Avenue, passing West 129th Street, when he stopped then reversed on the avenue, striking another car and crashing into a lamppost around 12:45 p.m., officials said. The driver, who was 72, was taken to Harlem Hospital Center, where he was pronounced dead, the police said. Alvareid Ferrell, Cynthia Ferrell’s husband, said he rushed to the van and climbed through the back to put it in park. “I was worried about the car taking off again because his foot was on the gas, so I took the keys out. The driver was (passed) out. There was no blood. I checked his neck and listened to see if he was breathing, but I didn’t hear nothing,” the 61-year-old man said. Cynthia Ferrell said she then ran up to the driver-side window and administrated CPR. “I unfastened his jacket and unbuttoned the top of his shirt and took his dentures out. I tilted his head back and closed his nose and blew puffs. Then I started pumping — chest compressions — 20 times,” she said, adding that the driver started breathing again. “A nurse stepped in and said, ‘Don’t do it no more. He’s breathing.’ He was breathing for about 2 minutes and he stopped again,” she said. "Oh God, I’m sorry to hear that. I did everything I could," she said when she heard the driver had died. Two other men who were in the car that was struck by the minivan were also transferred to Harlem Hospital in stable condition, officials said.